Book a skilled gardener in Washington DC. Backed by a total satisfaction guarantee and amazing customer support. Washington DC is our nation's capital and is known for its many memorials, a certain white house, and its lovely cherry blossoms. However, there are other things that make our nation's capital a great place to be in. It has fantastic restaurants, lovely recreational parks, and plenty of cultural activities that should help keep you busy. With so many things to do and places to explore, why are you spending your weekend doing work on your garden? Let Lawn Love take care of this for you as we can provide great gardener service that will be worth your money. Having a beautiful garden can help transform your property on the outside. Regardless of what kind of garden you want to have, you will need to devote a good amount of your time and effort to make it a reality. Some homeowners simply do not have this luxury because their schedules are already full, and they'd much rather spend their free time doing something enjoyable. At Lawn Love we understand what it takes to make a garden look great. Our gardening experts can do many different kinds of tasks, including watering, trimming your shrubs, flower planting, and weeding. If you think your yard could benefit from our world class gardener service, call us at 202-798-5885, or get a free online quote. The lawn looks great! Love your service. Super affordable. Thorough and nice job. Very friendly! The individual provided great follow-up. When speaking to Darius, he appeared to be positive. He seemed to understand my concerns which was greatly appreciated. Kudos to Lawn Love! Thank you, Michael. Great job, as always. David did a great job with the lawn and we even came home to swept sidewalks and a swept front porch. Really incredible service! Outstanding service!!! Highly recommended. 5 stars!!! Jernard is a great lawn pro! We were in Destin Florida during the time he was here. But we are very happy with the service. Jernard always does a great job!! Even trimmed weeds in plant beds!! Awesome!! He was great! My lawn looks awesome and the grass was super high before he got here!!! I would recommend him to anyone. Though my grass is not in the best condition, this is the first time that I have been very pleased with the service. My lawn was cut and very neat, the sidewalk was cut, the lawn looked good, and everything was cleaned up. Noah did a great job with the mowing. Thank you! Mr Hamim was prompt and efficient and very friendly. I hope to have him work for me again. He took care to ensure a nice and neat cut of the yards, including sidewalks. Things went smooth, no issues. Thanks! Noah is the best. He is very professional, knowledgeable, and skilled. Thank you so much for working with me through a miscommunication that wasn’t your fault! Rated 4.75 / 5 stars in 1,038 Washington DC customer reviews. It looks like the expected precipitation in Washington DC is 1.17 inches, which means your lawn got a nice soaking—leave those sprinklers off today. Dusk and dawn are the best times to water your lawn (the sun will rise at 6:27 AM and set at 7:48 PM today in Washington DC). 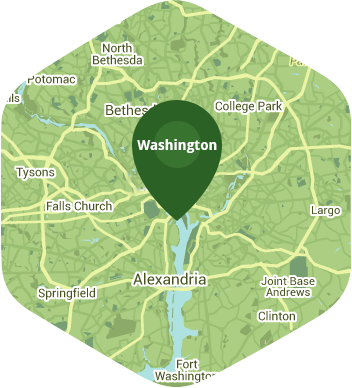 Here are some average lawn care prices for homes in Washington DC.